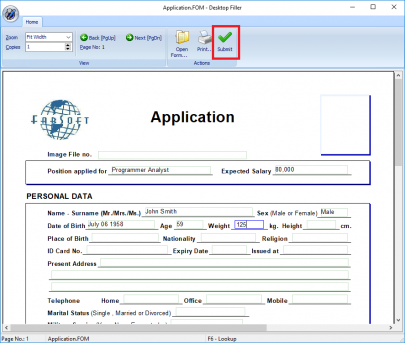 Reform Desktop Filler is a Windows application that allows users to manually complete forms. The forms have the ability to use database lookups, verify user input, and can be routed to email, fax, archive, or a printer. 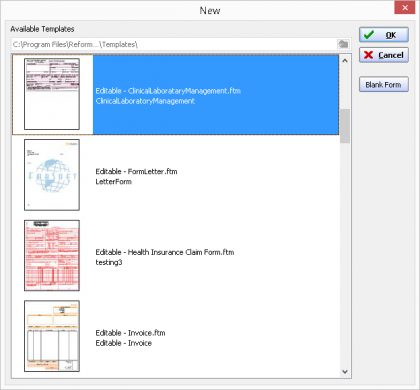 Other plug-ins such as Document Authority Control or TagDoc can also be applied to Desktop Filler workflows. 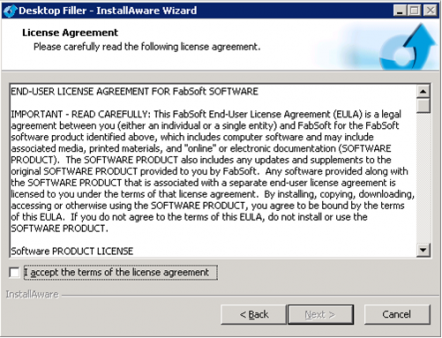 All required Reform software downloads can be found from FabSoft's downloads section. 1. 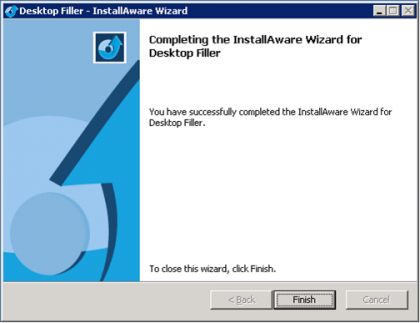 Download and run the Desktop_Filler installation executable. 2. Step through the prompts and accept the User License Agreement. The installation will begin. 3. Allow the installation to complete and then read on to the next section to learn how to use the Desktop Filler. Click on Finish to exit out form the installation window. The default installation directory is C:\Program Files\Desktop Filler. If you have changed the path during the Reform installation routine, please refer to the appropriate path instead of the default one referenced throughout this documentation. 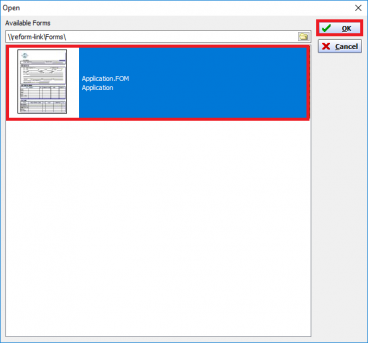 This tutorial requires the Reform Variable Data Printing plug-in in order to edit a form. 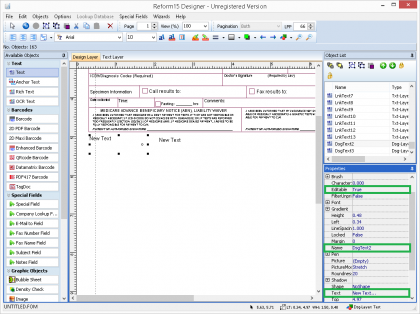 The following instructions explain how to create a new form using an existing template. From the top menu bar, click on File > New > New. From the list of available templates, select Editable – Application_Page1-1 and click OK. When prompted to open a text file for designing, select No. From the top menu bar, click on File > Page Setup. Select the printer that you want to use by clicking on the Printer Icon. Once the settings have been entered, click OK.
From the top menu bar, click on File > Save As. Save the form as Application. 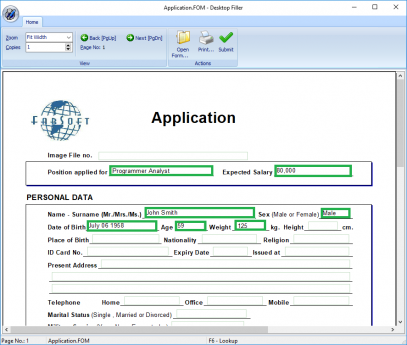 Your Application form is now ready to be used with Desktop Filler. To enter data onto a form via Desktop Filler, the form in question must first be editable (see creating form from templates). Click the icon in the upper left, then click Setup. If not added automatically, we need to enter the paths to the Spooler directory and the Form directory. Veryify that the paths are correct and click OK.
You are now taken back to the main Desktop Filler window. Click on the Open Form… button and select Application.FOM from the list and click OK. Fill out the form by selecting the fields and typing your information. Click on Submit to print the document. You will get a prompt that a text file has been saved in the Spooler directory. 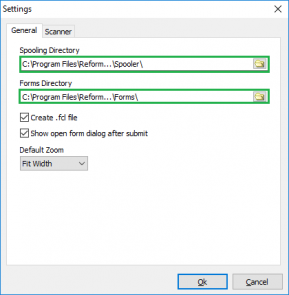 The Reform Spooler will match up the text file with the form that was saved. Ensure that the Reform Spooler is running on the Reform Server. The document will be printed with the information you entered. To demonstrate modifying a form to be used with Desktop Filler, we will create a new form using one of the pre-installed templates and then modify it as needed. Open the VDP Designer by going to Start > Programs > Reform… > Variable_Data_Printing > VDP Designer. 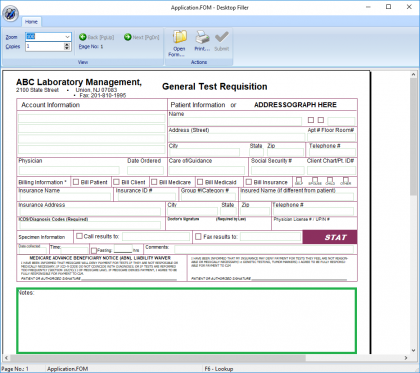 Go to File > New > New> Select Editable-ClinicalLaboratoryManagement. You will be asked if you would like to open a text file. Select No. Go to File > Save As . Type in SAMPLEFORM.FOM. At the bottom portion you will be creating additional field for the Notes. Click on the Add Link Text and draw 2 boxes in the form. Now you’ve just finished modifying the form. 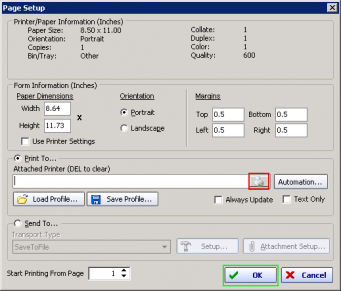 Go to File > Page Setup and select a printer. When finished go to File > Save. Open up Desktop Filler and select SAMPLEFORM.FOM. You will see the Notes field is added on your form. Fill out the notes field and click on the Submit button to print the document. To add custom submit and init scripts to Desktop Filler forms, you will need to specify the script paths. 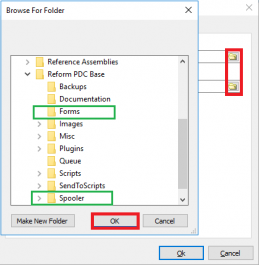 Navigate to File > Form Properties... then double click on the icon next Page-Process Script. Enter the desired script paths. Note: Make sure that the paths are accessible from any workstations running Desktop Filler. This means that the scripts should be in a shared folder and a UNC path should be used. Selecting a FCL file extension, the default installation of Desktop filler will register the .fcl extension. If a user click on a file with the fcl extension it would automatically execute the command DesktopFiller.exe -t <FCL filename>. This will use the FCL file and find the matching .fom based on the .fcl file name. Executing the DesktopFiller.exe <FOM Filename> from the command line will open the FOM file only. Desktop Filler can also be used in workflows requiring signatures on a document. Select Editable - Signature.ftm from the list of available templates, then click OK. When prompted to open a text file, select No. Enter Signature as the file name, then click Save.. Select Signature from the list of available forms, then click OK. If the Available Forms window does not open up automatically, click the Open Form button at the top of the screen. Fill out the available information on the form. At the bottom of the form is a signature field. Clicking on this field will open a window to write a signature in. There are certain directories that need to be monitored for growth along with the Desktop Filler plugin for Reform. As a system processes more and more jobs, the size of these directories can grow very quickly. Overall system performance can be affected by the large amounts of space that the files may take up. Obsolete files/database entries should be deleted according to your needs and file retention specifications. Forms are not displayed on Desktop Filler. Go to File > Setup and make sure the Form Directory is set correctly. You also need to make sure the Spooler Directory is correct otherwise your form will not be processed. A field won’t allow you to enter information. 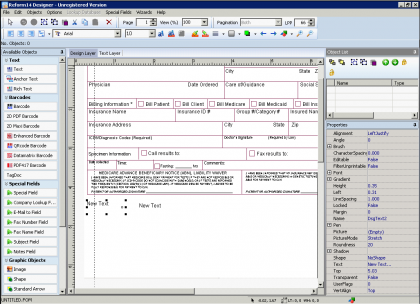 Open the form from the VDP Designer and check the properties of the field. Verify that the Editable property is set to True for the object’s properties. This page was last edited on 10 May 2018, at 11:58.